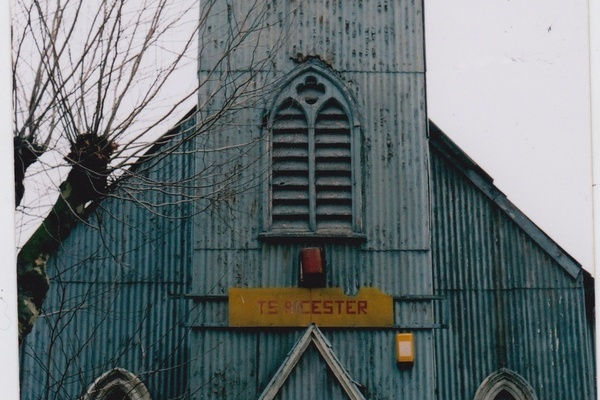 Built 1863 - a large corrugated iron chapel. 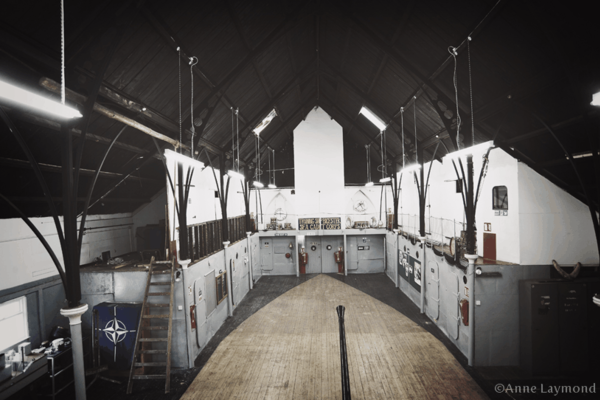 Inside was transformed after the last war into a battleship by local sailors, for Sea Cadets, and it has decks, portholes, bridge and even a Bofors gun. Also the set from the film Becket. Training Ship Bicester is one of the largest corrugated iron structures in Britain of this type, and similar buildings are dotted around the old British Empire. It was constructed 150 years ago in double quick time as a temporary Congregationalist church (St James) by James Bailey, in an attempt to keep the railway workers and other artisans of Cambridge Avenue on the straight and narrow. Ecclesiastical details remain under the floor in the form of a full immersion baptismal font. In 1902 it gave up the struggle and served mammon as a Pierrot theatre, cinema and meeting venue etc, when it came under the wing of the extraordinary Lord Lloyd of Dolobran (Lord Lloyd Hall), who, when he wasn't being Secretary of the Colonies and Governor of Bombay and Egypt, was blowing up trains with TE Lawrence. 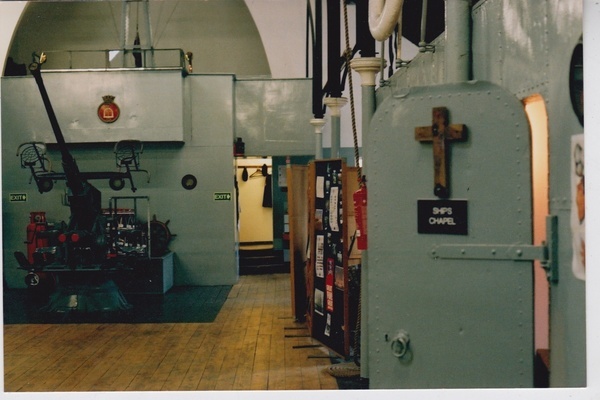 After the second world war, it was passed over to the Sea Cadets who proceeded to magnificently turn the interior into a BATTLESHIP, with metal cabins, portholes, decks, bridge etc etc, even a Bofors gun (from Portmouth) and a ship's chapel (stained glass and altar from the 1960 film "Becket" starring Richard Burton and Peter O'Toole, the modern TE Lawrence). The Sea Cadets remain, still doing wonderful work, imbuing the naval spirit into the young people of Kilburn and the surrounding area. In addition it is also used for many other community (and artistic) activities with organizations such as Artangel. The building material of galvanized (wrought) iron is the forerunner of all modern temporary buildings and, as with the prefab, the word "temporary" begins to mean "permanent". It has a similarity to the philosophy of Ikea ... a "flat pack" – of remarkable versatility, equally viable from the snows of Canada to the Jungles of Sarawak. 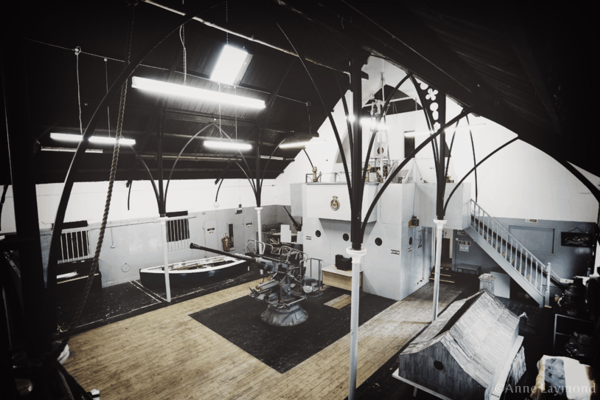 The functionality of the building is very satisfying but in this building there is a unique combination of the work of local people and Victorian industrial practicality that is aesthetically thrilling. Generations of children have been inspired by it and there is much historic and quirky Naval memorabilia. The large spire above the bell tower is, sadly, gone but the wonderful iron Gothic arches remain, as well as the Canadian pitch pine roof. The Gothic windows and entrance provide a marvellous frame for the bronze and iron portholes which seem to be everywhere. In a way, it can be said to be a complete work of art in the combination of architectural simplicity and wild marine surrealism. In the chapel it should be noted that even the portholes are in stained glass. The tarry smell of the rope room, with its naval layout, is echoed in a large variety of cabins, all different. The best vantage point is from the perfectly reconstructed bridge, which looks beyond the gun at the trompe l'oeil quarterdeck, as it spears its way to the large Gothic front door, ready to set sail down Kilburn High Road.